HomeNew releasesGlenmorangie Grand Vintage Malt 1989! Glenmorangie has released the second release in their Bond House No. 1 Collection, the Grand Vintage Malt 1989. The first in the series was the highly reviewed Grand Vintage 1990 released back in 2016. Grand Vintage Malt 1989 is Glenmorangie’s first expression to be part-matured in rare ex-Côte-Rôtie casks, the whisky is chill-filtered and bottled at 43% ABV. 6000 bottles are available worldwide at an RSP £550. Nose: Toasted marshmallow, almond, and a curious, perfumed top note. Some classic, buttery notes of vanilla and fudge, then a burst of fruit notes. Baked apples, red fruits, blackcurrants, some tropical fruits, fragrant wood smoke, freshly baked bread and beeswax. Taste: An oily, viscous mouthfeel with a gentle peppery sensation on the palate. More baked apples, fudge and gentle citrus flavours. Finish: Floral orange blossom and honey, hints of eucalyptus oil and sweet aniseed, along with some leather and oak. With water, more tropical fruits and an intensified citrus note, like dried zest of clementine. The long finish ends with classic wood spices and oak shavings. 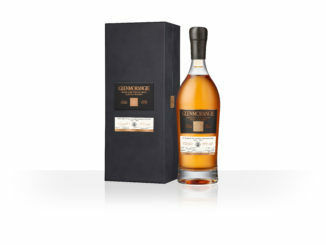 “Spirit from the final days of Glenmorangie’s former still house is celebrated in the inimitable cask assemblage of Glenmorangie Grand Vintage Malt 1989, the first Glenmorangie expression to be part-matured in rare ex-Côte-Rôtie casks. This rich and complex single malt whisky is the second limited release in Glenmorangie’s prized Vintage Collection – Bond House No.1 – which explores some of the Highland Distillery’s most prestigious parcels of aged whisky. Marked for greatness from their year of origin, each expression has been captured in its prime by Glenmorangie’s whisky creators – and is deemed ready to share only at the perfect moment of maturation. Glenmorangie announces the 175th Anniversary Single Cask!